When I researched about this problem I came across this. So I know this is possible in Wifip2p api, but I want to achieve the same thing with Bluetooth api. Is it possible? In Wifip2p api the app broadcasts some text (let's say the app unique code) that other devices (running the same app) are listening and respond, so I can show the device list running my app. But is it possible to broadcast something to all nearby devices using the bluetooth api? Of course it's possible. Bluetooth applications follow a typical client/server architecture. See the official Android documentation for more info. I have implemented BLE and it works. The flow is: DrawerActivity starts, it sets a fragmentA, which has BLE implementation, because I want active BLE only in fragmentA. So if you switch to fragmentB it should terminate the BLE connection and upair the device. What happens is that the only time it completely disconnects is, when you close the app, or turn off the bluetooth. If you close the fragmentA and open it again it works from drawerActivity. If you do it again, so this is now the 3rd time, it won't pair to the BLE device. When I investigated further, it won't even find the correct BLE device.. Meaning if you run the fragment the 4th, 5th time it is the same result. What I want to achieve is when onDestroy in Fragment is called it should disconnect from the BLE and destroy all references. And then if you go into the fragmentA again it should recreate everything again, no matter how many times you open the fragmentA.But now the device isn't found anymore, probably because it didn't disconnect properly and BLE device has old references or something. This is how I disconnect. Here are the all 3 files that are used for BLE. // If bluetooth is not enabled, request permission, otherwise start scanning process, Not IMPLEMENTED, because it is not needed. * Initializes a reference to the local Bluetooth adapter. * @return Return true if the initialization is successful. Can some one help me with the implementation of unit testing for Bluetooth connection in android. What would be the unit testing implementation for scanning for bluetooth connection. * scanning of WiFi networks (if WiFi is available). * sends it to the main activity for being displayed. When I connect my phone to Wi-Fi, I am able to download the PDF, the notification was shown in notification bar and I can open the PDF by clicking the notification. However, if I switched to Mobile Data, nothing happened and the PDF was not downloaded. May I know the reason or is there any solution to solve it? i know how to write code for nodemcu i'm just asking how to connect nodemcu to any available wifi without giving static ssid and pasword in the code here is a piece of code i have written..
i need the code for nodemcu to get ssid and password from app to connect to any wlan i have watched many tutorials but didn't found the solution. I would like to setup Android Wi-Fi P2P local service with some dns records, and i've already done it. My application needs only these records and there is no needs to make connection between peers. But I'm facing with a problem, the service is visible from other android users, and they could try to connect to my application's service. My app's user will see acceptance dialog: "Accept sharing request?" and it's quite annoying. Is there any way to make my service not accessible or drop connections before showing acceptance dialog or make password authentication like in wifi hotspot? Thanks. I am testing a simple chat application between HTC_Desire_10 pro (running Android 6.0) and OPPO A83 (running Android 7.1.1). I have the same app running on the two devices. The app first turns wifi on, then starts discovering peers on a users click event. The user can choose the device they want to connect to from a dynamically generated peer list. The two devices are able to connect successfully. 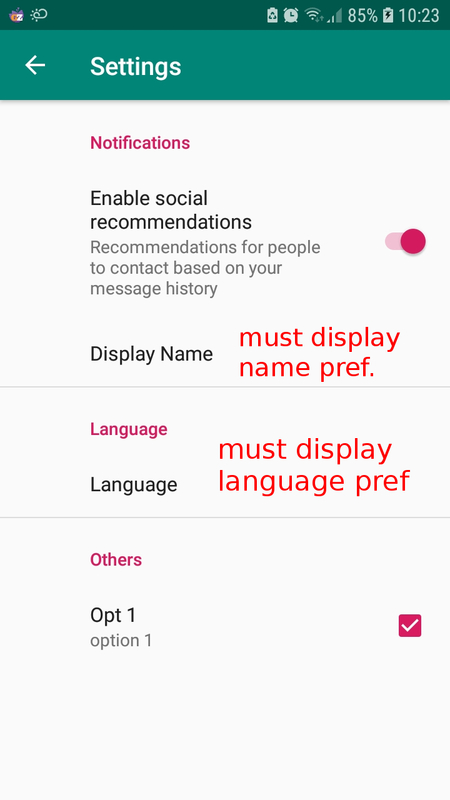 I am able to send a text message from the HTC to OPPO phone but when I try to send a message from the OPPO phone, the app crashes. The SendRecieve functionality gets invoked when a user clicks a send message button. Can anyone please explain why the app behaves this way? I have gone through the entire logs for about an hour and I cant seem to find what's exactly going wrong in my code. Any help will be appreciated. So I'm just starting to learn how to connect two phones wirelessly over WifiP2p using my app. My app is a simple game of Rock, Paper, Scissors. Nothing overly complicated, and I'm trying to get the two test phones I'm using to "talk" to each other (example: one chooses rock, other chooses paper, and they update appropriately). just to get it to run for testing purposes (I know the above stated code is a horrible idea), it will sometimes work, but mostly just crash. I also constantly keep getting the NetworkOnMainThreadException, which I thought I shouldn't since I extended the Thread class. And I've tried creating "implements Runnable" methods to no avail. I considered using AsyncTask, but from what I've read, it'n not entirely the best choice, and also the android developers corner suggested using the Thread class for the simplicity of what I'm trying to do, which is essentially just sending a message from one phone to another. Still can't get anything working. And then I have my main multiplayer class caller Multiplayer, which is very large so I'll break it up. I have a listView that displays all nearby devices, which a user can connect to by item click. I also have a WifiP2pManager.ConnectionInfoListener and the appropriate methods for setting a user to host and another to client. These seem to be working so I won't paste the code in an effort to avoid as much clutter as possible. I also won't post the onResume() or onPause() methods as they are not an issue. I believe that one of the main issues is the write(byte bytes) method, since every time I press one of the buttons, such as Rock, I get a NetworkOnMainThreadException, where the stackTrace points to the sendReceive.write(msg.getBytes()); line of the button's code. So I'm thinking it has somethign to do with the SendReceive class being on the main UI thread, which I thought it wouldn't be since I overrode the run() method when I had the subclass extend the Thread class.